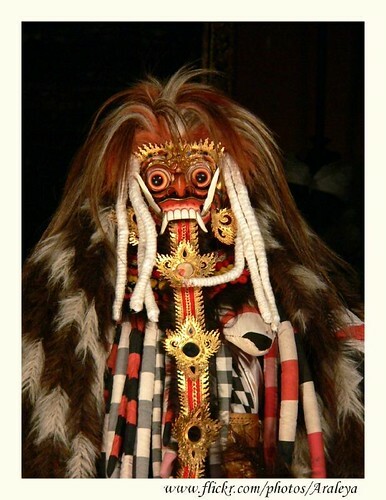 Rangda.. The Black Side, originally uploaded by Araleya(Going to China). Rangda.. the Widow who turn herself into balck magic world and transformed herself into monster..
Love the philosophy of Bali Hindu.. living with the fact of life... It's not to win the bad and get rid of it but it is to control and balance.. The balck and white scotch clothe wrapping the guardian sculpture is something saying this believing..
Its like Yin Yang the existing of two extreme dualities in balance.